The end of our winter and beginning of our spring here in Colorado has been unusually warm and dry. The 70 degree days have been calling us outside and we have definitely been enjoying the weather. The catch is that we need the moisture that we haven’t been getting. Without this precipitation, we are going to continue having high fire dangers. Fortunately, the forecast is predicting a very wet storm to come across Colorado that might just bring us up to where we need to be for precipitation for the year. So you might not want to go for a walk outside tomorrow but hopefully, this storm will make for a less smokey summer and protect our state during fire season. Big change coming to Colorado weather after dry spell – 7NEWS Denver TheDenverChannel.com DENVER — We have a BIG CHANGE coming in the weather late Thursday through Friday. 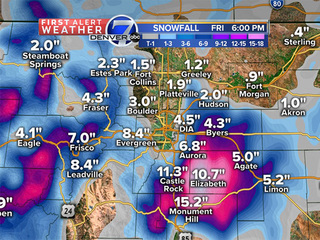 A strong storm system will swirl into Colorado from the west and will bring a good shot of moisture to Colorado. For many areas on the eastern plains, this storm will bring the first significant rain and snow in months and will be very welcome due to the recent dryness. The storm will sweep into Colorado from Utah by early Thursday and will move across the state Thursday night and early Friday. Ahead of the storm, windy and warm weather will hold for another day over eastern Colorado, with High Fire Danger for Denver and the plains. Are you and your home prepared for another storm? Interstate Roofing serves homeowners across the Colorado Front Range. If you have any questions or need help with your home before or after a storm give us a call.